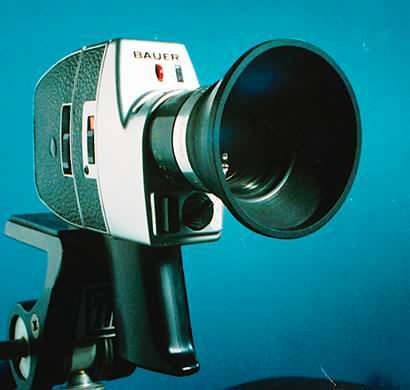 Made in Germany, the Bauer C2M features world-class Schneider-Kreuznach optics!! The zoom lens is f1.8/ 8-40mm Schneider-Kreuznach Variogon manual zoom capability. The optics in this lens are as sharp as were ever made for the S-8 format. The lens itself is clear, clean and scratch-free. It has a brilliant reflex viewfinder permitting critical focusing. Lens focusing and zoom controls are silky smooth. The film transport and meter appear to work normally. There are four shutter speeds available: 12, 18, 24 (for synch-sound) and Single-Frame for animation/time-lapse and other special effects. There are cable release sockets for Special Effect wipes and for Single-frame exposures. A red elongated button on the front of the camera allows you to lock onto an f-stop, or for general shooting you can use automatic mode by itself. There is a tripod socket on the bottom for mounting on a tripod. The camera uses (4) AA batteries, which also operate the built-in exposure meter. The camera is in very good condition, no obvious marks or scratches, clean, very nearly new looking. Accessories include a rubber eyecup, lens cap, and lens shade, all in good shape. 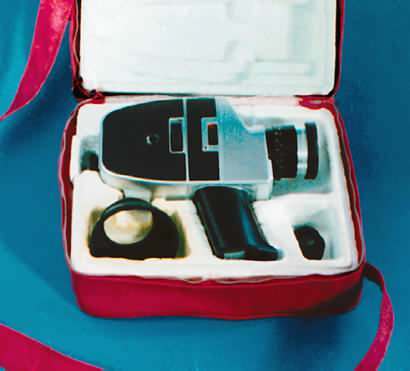 The funky red case shown in the photos appears to be an old makeup case or lunch box converted to retain the camera's original molded packing foam (white color), which has protected it well for many years. One of the two zippers on the case is off its track. One works well enough to hold it closed though. 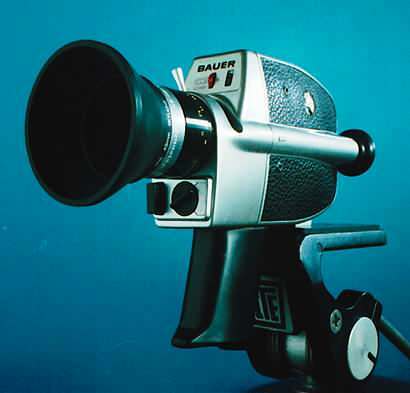 Bauer C2 Super 8 Film Camera Specs. Special C2 feature: Wiping mask for wiping out and wiping in. 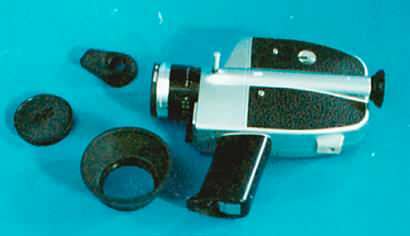 A cable release socket on left side of camera permits the gradual wiping-out or wiping in of a view at the beginning and at the end of a scene. Pressure on the cable release will make a mask travel diagonally across the frame and obscure the picture. When the cable is released, the mask will gradually reveal a new scene. In projection, the mask seems to wipe out the scene diagonally from the bottom right to top left. Upon release of the cable release plunger, the scene will open from the top left to the bottom right. 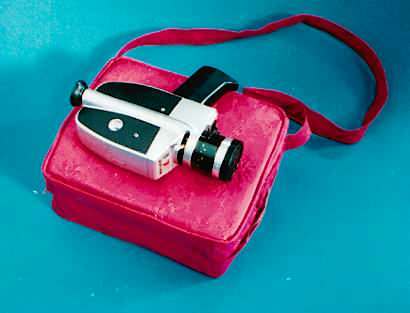 A very well designed solid German camera. 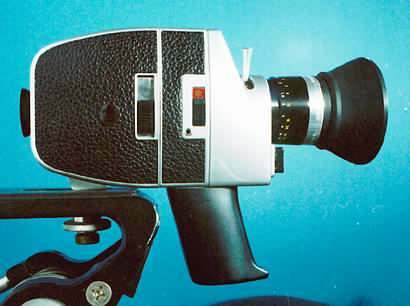 Ideal for the serious S-8 filmmaker or student! Tons of stuff to be scanned and uploaded soon. All content c. 2001 by R. D. Nelson. All rights reserved.